Yesterday I shared a photo of a giraffe and talked about how sweet they seem. Today I want to share a photo of this leopard. He’s probably one of the most beautiful creatures I’ve seen in the wild. I think he knows it. 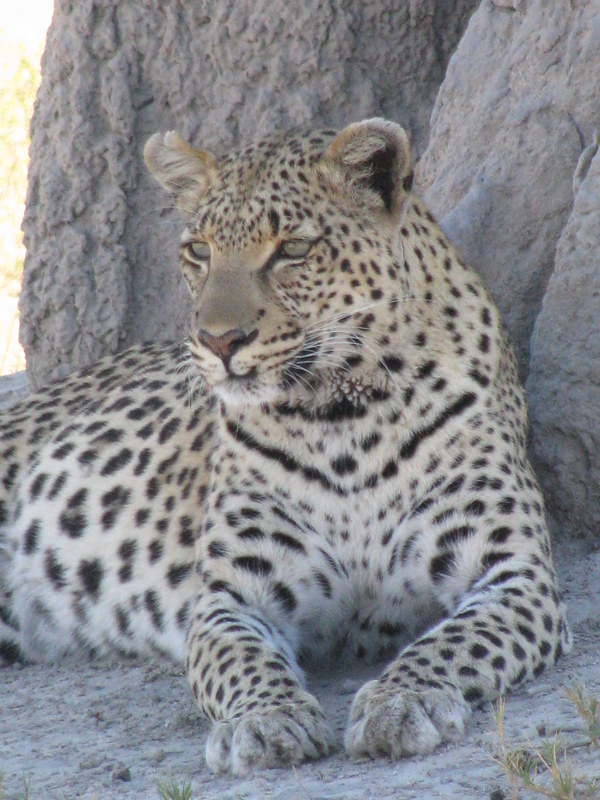 This entry was posted in Travel Photos and tagged 50 Year Project, Animals, Botswana, Cats, Leopards, Life, Nature, Photography, Travel, Travel Blog, Travel Journal, Travel Photo, Wildlife. Bookmark the permalink. Thanks Kate. I didn’t too many photos of him since I couldn’t stop staring at him. He is gorgeous. Yes…I wonder what they see. He didn’t notice us at all. I wish I could see one every day. Is he an Amur leopard? They are extremely endangered. I don’t think so. At least I don’t remember the guide saying he was An Amur Leopard. But there aren’t too many of them. There aren’t many big cats left, which is a horrible shame. Oh, what a gorgeous…and very proud animal! Beautiful – but watch out for those claws! Seriously! I don’t think it would take him much effort to deal with me. For sure he knows 😀 Majestic! I sure hope so since he is majestic and he should know it. He is lovely – but I wouldn’t like to be too close – totally different eyes. No soft brown eyes here. Steely, determined and calculating. But I do love the big cats! Big cats are amazing, but yes, I kept my distance. I can’t even imagine being out on a walk and running into one. Yikes!